I truly feel like I was just talking about Cam being 3.5. 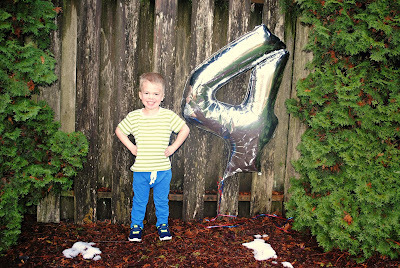 Now, here we are and he's four. FOUR!!! And as he was very quick to remind me, "four is almost five!" Man, do I love this kid. And truth be told - I have heard horror stories of the "three's." 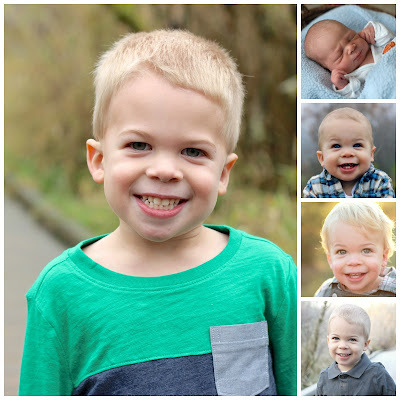 But to be honest - I loved (almost) every minute of Camden James as a three year old. I know I am biased and President of the Camden Fan Club, but he is one cool dude. - he got Track Master Sky High Bridge Jump for his birthday and he through the roof excited. Just ask him about it. Or don't because he will talk so fast that you will hear "Sky Bridge" and not understand anything else. I asked him if I could "interview" him, and after explaining what an "interview" was - he obliged. Cammy, Cammy, Cammy. You are one special little guy. I love you more than I could have ever thought possible. You are kind, sensitive, funny (so funny! ), smart, and light up the room when you're around. I love seeing your imagination at work and watching the world through your inquisitive mind. I love you to the moon and stars, and all the way to Pluto, the dwarf planet.